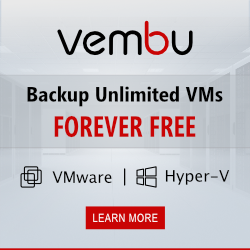 Need to back up your virtual machines? Altaro VM Backup is a fast, affordable, high performance backup solution, specially developed for small and mid-market businesses. Providing an agile, streamlined solution that is easy to implement, Altaro VM Backup is the natural choice for Hyper-V and VMware data recovery. Download a fully functional 30-day trial of Altaro VM Backup (Unlimited Plus Edition) or download the Free Edition, free forever, for up to 2 VMs per host. 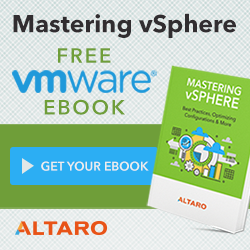 Visit http://bit.ly/altaroesxsi and see how easily you can securely back up your virtual machines.